An invitation to tender has been posted for the dualling of a 9.5km stretch of the A9 between Perth and Inverness. Transport for Scotland hopes to have the contract for the road upgrade from Luncarty to Pass of Birnam let to allow work to start before the end of the year. Works include widening of existing A9 to dual carriageway, side roads, full grade separated junctions, overbridges, widening an existing underbridge, retaining walls and a five year maintenance period for landscaping and defect rectification following completion. The successful tenderer will not be required to carry out cyclic maintenance. Firms can register to prequalify on the Project Scotland website. Design work also continues apace with 90% of the full scheme now at preferred route stage. 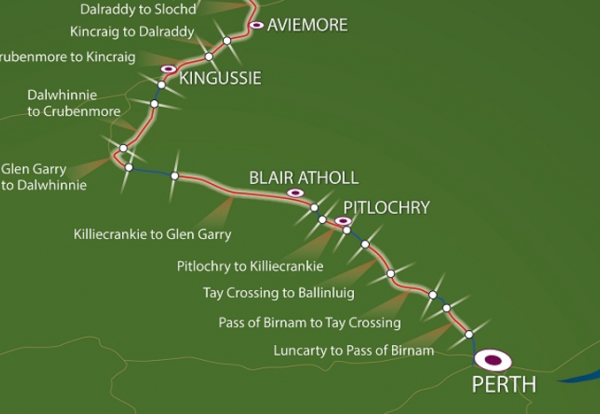 Preferred routes will be unveiled to the public today for the 24 km Dalraddy to Slochd and the 16 km Crubenmore to Kincraig schemes – a further 40 km of the A9 dualling programme. Work is also underway to identify contractors to carry out a series of advanced works across the entire route in preparation for future construction. Via Construction Enquirer. Read the original article here.